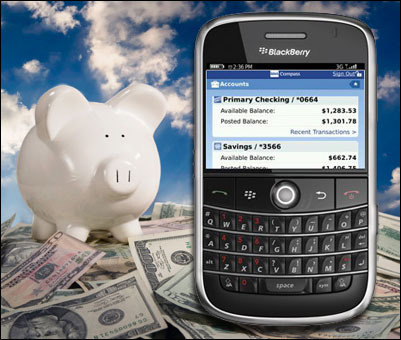 BBVA Compass Mobile Banking for BlackBerry - Banking When and Where You Want It! If you have a checking or savings account at BBVA Compass Bank, you're going to want to 'check' this out. Compass has a free app for your BlackBerry to help you keep track of and use your accounts while on the run. The app provides a fast, easy and convenient way to manage your BBVA Compass accounts and check balances, view posted and pending transactions, transfer funds between accounts, and find local branches. The Accounts button from the main menu displays balances and other information for each of your online accounts. Click Recent Transactions to view recent pending and posted transactions. Debit transactions are shown with a minus sign, and credits are shown with a green plus sign. Click the Transfer button on the home screen to transfer money between accounts. The Help & FAQ section will give you answers to general questions about the app. Use the Contact Us option to find the closest branch by zip code, send a secure message to customer service, or to call customer service. See a map of the chosen branch, and get directions. You can pick this one up in BlackBerry App World, or by texting BLACKBERRY to 56355 and according to App World it's compatible with all BlackBerry smartphones running OS 4.2.1 and higher.